At last the renowned Brasilian musician Antonio Adolfo, pianist and pedagogue has followed esteemed fellow-Brasilians Moacir Santos, Antonio Carlos Jobim, Hermeto Pascoal and Mario Adnet in creating music for a larger ensemble. While retaining all the foaming warmth and shuffling rhythms of (Carioca) Brasil Mr Adolfo’s music – much more fulsome with brass, winds and guitars here – cuts through the air with wonderfully sharp and silvery harmonics that weave sinuously through these ten melodies. 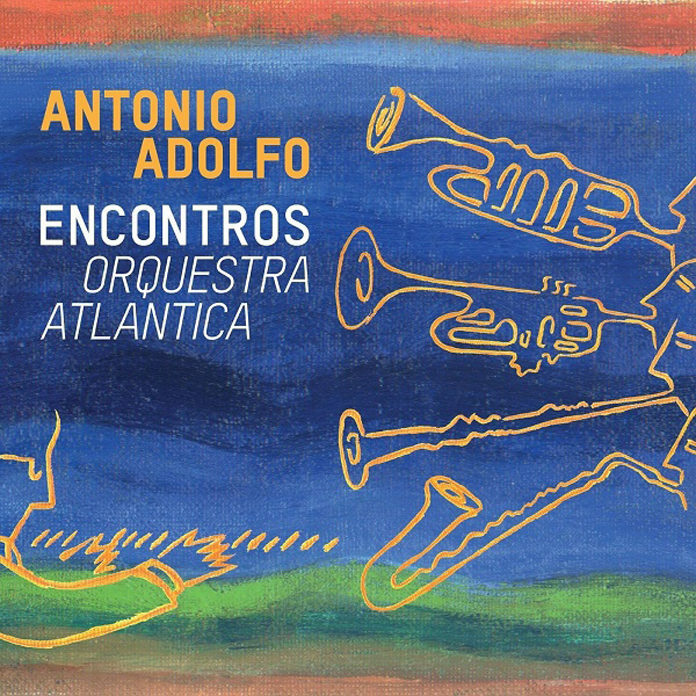 Always, of course the music is guided onward by Mr Adolfo’s sometimes gliding, and often percussive, pianism and supported by the steady in-the-pocket drumming and percussion of Rafael Barata and Dadá Costa. And all of this is shaped by the sensuous bass lines of Jorge Helder who, together with Jessé Sadoc, a musician who Mr Adolfo has often called upon to anchor his groups – small and large. Mr Adolfo’s music has always worked on two distinct planes. One has been the narrative – one on which he has built often fascinating stories and adventures. The other is the visual one and here Mr Adolfo has tinted the black dots with colours from a very large palette. The scope of these has been generously enlarged on Encontros. As a result this music now has the effect of a kind of epic depiction of Mr Adolfo’s beloved Brasilian landscape and taken together this music acts as a kind of soundtrack to a breathtaking adventure. And it is enormously beckoning from the agitated, jazzy shuffle of “Partido Samba-Funk” to another rippling jazzy rendition of Miles Davis’ “Milestones” where the musicians of Orquestra Atlântica mark a dramatic dynamic contrast between the spiky legato arpeggio accompaniment and the characteristically laconic melodic top line. Mr Adolfo returns to the heart of Brasil with a deep-dive into the traditional “Capoeira Yá” and a dark, rumbling “Africa Bahia Brasil” which conjures the spirit not only of Moacir Santos, but also the great Dorival Caymmi. All the while Mr Adolfo employs tones and colours of the largest palette than one has ever been accustomed to hearing his music played. This also gives the arrangers the scope to introduce soloists who have been accorded time to improvise on themes and melodies. Each solo is a masterful essay and is played with intensity and a winning sweetness of tone and manner. The result is a programme that works exceedingly well for Mr Adolfo. Special mention need be mentioned of the arrangements and orchestrations by Marcelo Martins and Jessé Sadoc for without their extraordinary work this might have been a wholly different album of songs. As it is with this and the other musicians who play Mr Adolfo’s wonderful music this will be an album to remember for a long time to come.